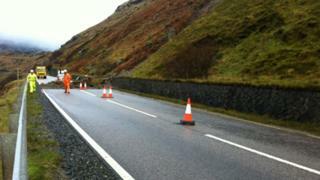 The A83 in Argyll could be closed for up to 24 hours after a landslide. Up to 100 tonnes of the hillside slipped, with some falling onto the Rest and Be Thankful, west of Loch Lomond, at 07:00, resulting in the road being closed in both directions. A long diversion is in place which will add significantly to journeys times. It runs via the A83, A819, A85 and A82. This is the third time in four years the Rest and Be Thankful, in Argyll and Bute, has been affected by a landslide. It was closed for lengthy periods in 2007 and 2009. The most recent slip follows several days of heavy rain across the country. There are about 30 flood warnings in force across Scotland, many of them in Perthshire. In Hawick, fire crews had to pump out their own station. Updating MSPs on the latest situation during question time at Holyrood, First Minister Alex Salmond said: "Engineers are on site as we speak, but there can be no clearance operation until the water has subsided and a risk assessment of any further slippage is carried through." Later Transport Minister Keith Brown added: "Engineers have been working to clear the route of around 80 tonnes of material and one lane is now open for emergency vehicles. " "Public safety remains our main priority and we appreciate the patience shown by those affected today. According to the Met Office over 65mm of rain has fallen in the space of 48 hours. "Since the last incident an early warning system has been installed, advising motorists of a higher risk of landslips occurring. These signs were operational this morning. "Flexible flow netting and a new culvert has been installed at the site of the previous slip and we have invested around £700,000 on prevention measures." He added that the Scottish government was investing £500,000 per year on a Scotland-wide landslide mitigation programme.